Plot Summary: Suomi Kyoko is the first princess of the 30th century Earth Nation... though she doesn't seem to like that title at all. Kyoko wants to live a normal life without responsibilities. As her desire to be completely free grew stronger, she discovered that there could be one possibility for her: if her twin sister Ui, asleep from the very day of her birth, could be awakened, she could take Kyoko's place as the future queen of the Earth. Unfortunately, the only way to wake Ui is finding the twelve God Stones, as well as the twelve Strangers, the persons who can control them. 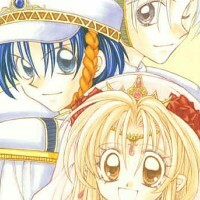 With her two loyal bodyguards, Sakataki and Hizuki, Kyoko sets off on a journey to stop her sister's enchanted sleep.